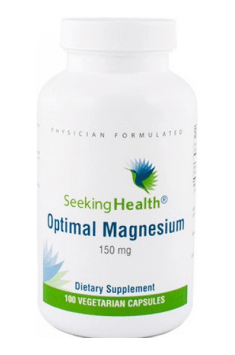 Optimal Magnesium 150mg 100 caps. In order to increase the assimilability of the preparation, it is recommended to take magnesium along with vitamin B6, which increases magnesium bioavailability by 30-40%. Magnesium supplementation in case of cramps of lower limbs should be enriched in potassium. It turns out that such a combination helps to fight with this problem. People in the period of increased physical effort should take magnesium at the dose of 300-500 mg a day. It is recommended to take the supplements with magnesium on an empty stomach with a lot of liquids.